Little Bones – Close up on me ! Shoes : ENCHANTE’ – Party Rider Gachas – Mia Boots – RARE. 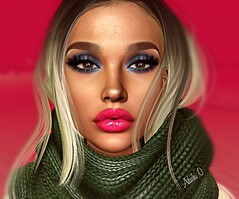 Eyes : EUPHORIC – Anya Eyes Catwa Applier. Bottle : CHIC CHICA – Fruit water # 14 ( Gacha) .By Lilo Denimore POCKET GACHA!